Belbal 12 inch metallic finish assorted colour latex balloons. High quality Belbal latex balloons are helium quality. 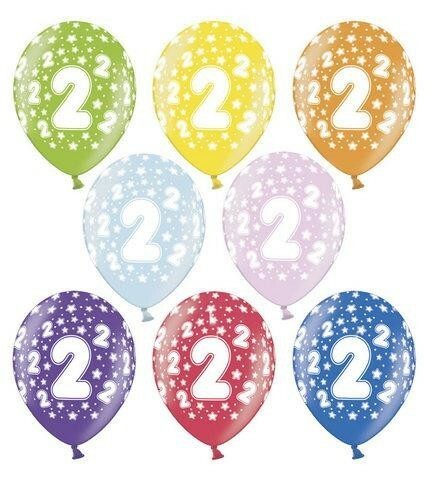 Balloons are printed with the number 2 and stars all over in white ink. Perfect for decorating your party room. Other ages available 1-10, 16 and 21 Pack contains 50 balloons including green, yellow, orange, pink, pale blue, dark blue, red and purple. Join our mailing for all the latest news, video updates and reviews. © 2019 - Helium Products Limited. All rights reserved.